The Dugout Manager can organize equipment so you can enjoy watching the game! ARE YOU SICK OF BEING THE EQUIPMENT ORGANIZER? Moms, you know you’ve been there: “Can you hold my drink?” “Will you watch my stuff?” “Where’s my glove?” “I can’t find my bat!” You want to enjoy watching the game, but somehow, it seems to fall to you to keep track of the equipment instead. The Dugout Manager can organize the equipment and free you up to enjoy watching the game! It’s difficult to watch all that expensive gear tossed on the dugout floor, getting kicked around and potentially ruined or lost. You want your child to be able to enjoy playing and you want to enjoy watching the game. And when the game is over – you want all that gear organized and ready to go so you can focus on celebrating your child’s commitment to the game! 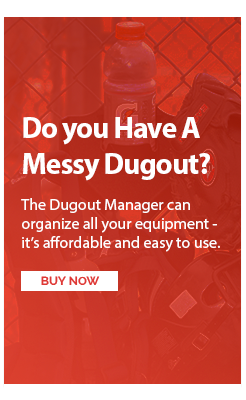 Eliminate the stress of equipment organization with the Dugout Manager. The dugout manager (DOM) securely organizes all your child’s equipment in one place so you can relax and enjoy watching the game. This patented design even keeps drinks secure where they won’t spill, or get lost in the chaos. With the Dugout Manager makes it so much easier to get your child on the field and off the field in record time – AND with all their equipment! The DOM can also be used to hold a cap, visor, towel, catchers gear, and more all on the same hooks under the glove or helmet. No more worrying about watching all that stuff. You can focus on enjoying the game! Instead of being the gear watcher – you can actually watch your child PLAY BALL! Kids grow up way too fast. You don’t want to miss all the best moments because you are watching gear instead of the game! The DOM is affordably priced, durable, and manufactured in the USA! https://www.dugoutmanager.com/shop/ and start enjoying game days!